A "bat barn" is being built ahead of plans to demolish the derelict hotel where the mammals are currently living. 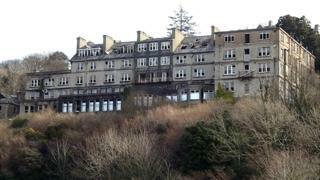 St David's Hotel in Harlech, Gwynedd, has been dubbed an eyesore by local residents since it closed in 2008. Snowdonia National Park Authority (SNPA) has now appointed a contractor to build a bat barn so the unsafe building can be demolished. Hotel owner Aitchison Associates has paid out £21,900 in fines for failing to carry out an order to knock it down. SNPA is now exploring the possibility of demolishing the 1910 building itself and recovering the costs from the Gibraltar-based company which owns it. The authority says the hotel's "unsightly appearance seriously detracts from the surrounding vicinity and prevents the economic development of Harlech". However, it added that as bats were protected by law, it was working with specialists to relocate them. Jonathan Cawley, the authority's director for planning and land management, said building a new home for the bats was "an important part in the process of removing the eyesore that is the derelict hotel". "We will continue to pursue the issue of demolition, but there are still significant constraints to overcome - with financing the work being the primary issue," he added. In 2009, Aitchison Associates was granted planning consent to demolish the building and replace it with a new 130-bedroom hotel and 76 holiday apartments. But these plans have never come to fruition, according to the Local Democracy Reporting Service. The owners were issued with an enforcement notice in 2015 to demolish the building by April 2017. While the park considers demolishing the hotel itself, it has permission from the owners to build the bat barn, which it hopes will be completed by mid-March.